Levels 1 - 2 - 3 - Connect with the world around you. Build a foundation of fundamental vocabulary and essential language structure. Quickly gain the confidence to enjoy social interactions such as greetings and introductions, travel, dining out, giving and getting directions, shopping and other recreational activities. Learn to share your ideas and opinions, express your feelings and talk about everyday life. As children, we gradually learned our first language through a process of associating mental images with words or phrases, accompanied by complete immersion in our environment. This approach was simple because it was natural and allowed the brain to adapt to increasing complexity. In learning a new language, Rosetta Stone replicates this process to provide the best and friendliest language learning software tool. Learn as many languages as you want! Rosetta Stone Personal Edition contains everything you need to start learning a language. It's built around the award-winning Rosetta Stone curriculum, which has been adopted by organizations around the world including the U.S. Army, NASA, major corporations such as Deutsche Telecom, IKEA, Royal Dutch Shell, and over 10,000 schools worldwide--and is available in 31 languages spoken by over 90% of the world's population. Proceed at Your Own Pace - Rosetta Stone is considerate of your time. Anytime, anywhere, you can learn a new language with Rosetta Stone. You learn comfortably without feeling pressured or overwhelmed. Rosetta Stone provides guidance to make your language learning effective, fast, and enjoyable with a process that is intuitive, interactive, and visually engaging. At the end of each lesson, you are given the opportunity to test your new skills. And, since Rosetta Stone automatically records your progress, you can easily pick up where you left off, when other priorities arise. Dynamic Immersion - Rosetta Stone uses rich visual imagery to help you learn. You will be presented with sets of images to match correctly with a spoken or written phrase in the new language. You will advance to the next set of prompts once you've successfully matched words and images and pronounced the words correctly. With Dynamic Immersion, you learn by directly associating your new language with images--nothing is lost in translation. This course includes Lessons 1-10 from the Arabic (Egyptian) Level 1 program - 5 hours of audio-only effective language learning with real-life spoken practice sessions. Get a chance to test drive the incredibly effective and efficient, world-famous Pimsleur Level 1 Program. Each lesson provides 30 minutes of spoken language practice, with an introductory conversation, and new vocabulary and structures. Detailed instructions enable you to understand and participate in the conversation. Practice for vocabulary introduced in previous lessons is included in each lesson. The emphasis is on pronunciation and comprehension, and on learning to speak Egyptian Arabic. Arabic is the world's 6th most common language with 295 million native speakers. It is also the liturgical language of 1.6 billion Muslims as it is the language of the Qur’an the holy book of Islam. Egyptian Arabic is mainly spoken in urban Egypt. Egyptian Arabic has also gained a high degree of acceptance throughout the Arabic-speaking world because of its use in films. 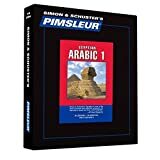 Pimsleur's Egyptian Arabic teaches the Cairene dialect, the prestige dialect spoken in Cairo, Egypt's capital city. Shuwayya 'An Nafsi ("A Little About Myself") will be of tremendous help to independent language learners who want to develop their conversational skills and increase their Arabic vocabulary. Bonus: Free audio tracks available to download and stream from www.lingualism.com. Shuwayya ‘An Nafsi presents the results of a survey given to 10 Egyptians. Each of the 30 sections in the book begins with a question from the survey followed by the 10 responses and a breakdown of the vocabulary. Each section concludes with a page where you are encouraged to give your own answer to the question using newly learned words and phrases. The book has been designed in such a way that it can be an effective learning tool for learners at all levels, with glossaries of even the most basic words for beginners, and unvoweled texts and Modern Standard Arabic translations for more advanced learners. This course includes Lessons 1-16 from the Arabic (Egyptian) Level 1 program - 8 hours of audio-only effective language learning with real-life spoken practice sessions. Each lesson provides 30 minutes of spoken language practice, with an introductory conversation, and new vocabulary and structures. Detailed instructions enable you to understand and participate in the conversation. Practice for vocabulary introduced in previous lessons is included in each lesson. Topics include: greetings, numbers, meals, shopping, telling time, scheduling activities, and asking and giving directions. The emphasis is on pronunciation and comprehension, and on learning to speak Egyptian Arabic. Learn Arabic in just 15 minutes a day with this revolutionary language learning system, now with an accompanying free app that is available in the App Store and Google Play. Practicing your language skills is quick, easy, and fun with 15-Minute Arabic. There's no homework. Instead, use the visual guide and the free app to test yourself as you learn. Perfect your pronunciation by listening to native speakers, and learn from real-life examples that cover every holiday and business situation. Each full-color course book has themed chapters and common everyday scenarios, a menu guide, and translation dictionaries. Whether you're just starting to learn Arabic or you want to brush up, there's no easier way to learn. Whether you want to travel, communicate with friends or colleagues, reconnect with family, or just understand more of what’s going on in the world around you, learning Egyptian Arabic will expand your horizons and immeasurably enrich your life. In the final 10 lessons, you’ll be speaking and understanding at an intermediate level. In this phase, more directions are given in Egyptian Arabic, which moves your learning to a whole new plane. Lessons include shopping, visiting friends, going to a restaurant, plans for the evening, car trips, and talking about family. You’ll be able to speak comfortably about things that happened in the past and make plans for the future. Reading Lessons are included at the end of Lesson 30 to provide you with an introduction to reading the Arabic alphabet. These lessons, which total about one hour, are designed to teach you to sound out words with Egyptian Arabic pronunciation and accent. A Reading Booklet to be used with the audio lessons is also included in PDF format. Kamaan Shuwayya 'An Nafsi ("A Little More About Myself") will be of tremendous help to independent language learners who want to develop their conversational skills and increase their Arabic vocabulary. Very simply, Kamaan Shuwayya ‘An Nafsi presents the results of a survey given to 10 Egyptians. Each of the 36 sections in the book begins with a question from the survey followed by the 10 responses and a breakdown of the vocabulary and concludes with a page where you are encouraged to give your own answer to the question using newly learned words and phrases. This book is the second of a two-part series. If you are not yet at an intermediate level of Egyptian Arabic, it is advised that you complete the first book, Shuwayya ‘An Nafsi (which includes features to assist elementary-level learners: phonemic transcriptions for the texts and even the most basic words are introduced in the chapter glossaries) before moving on to Kamaan Shuwayya ‘An Nafsi. In Kamaan Shuwayya ‘An Nafsi, only glossed words include phonemic transcriptions. Common words which appear numerous times throughout the book do not appear in the chapter glossaries. However, they can still be found in the glossary in the back of the book. The responses are typically somewhat longer than those in the first book. For more advanced learners, the texts appear again in the back of the book without voweling (tashkeel) or translations (Appendix B), to provide a more challenging reading experience without distractions. Modern Standard Arabic (MSA) translations of the texts (Appendix C) are also given for learners who are more proficient in MSA and can benefit from comparing the similarities and differences between it and Egyptian Colloquial Arabic (ECA). EGYPTIAN ARABIC: Easy Stories With English Translations is a fun yet challenging collection of simple, short stories aimed at both young and adult learners of the spoken language of Egypt. Designed with high-beginners to low-intermediate learners in mind, this book will improve your comprehension and build on your vocabulary as you progress through each carefully crafted mini story. One of the issues that many Arabic students of spoken dialects face is that most written material is in Modern Standard Arabic or Classical Arabic (formal dialect). There is very little available for learners who have moved beyond the basics and are looking for literary resources at an appropriate reading level in colloquial, spoken language. So we've carefully crafted a series of 12 short/mini stories that progressively increase in length and difficulty which we're sure you'll enjoy and benefit from. 12 mini stories on various focus topics, full of high-frequency vocabulary and expressions pertaining to those topics. Stories gradually rise in length and difficulty. Comprehension exercises at the end of each story (100% in Egyptian Arabic). Key vocabulary lists for each story. Larger font and moderate use of tashkeel (vowel markings) to improve readability for lower-level learners. Have already moved beyond the absolute basics of Arabic (High-Beginner -> Low-Intermediate). Already have foundational vocabulary of the most common words. Can already read Arabic script (there is no transliteration in the book). Absolute beginners with no previous Arabic knowledge. Advanced learners who may find it too easy. Importantly, these stories have been written purposefully in the everyday, spoken vernacular of Egypt. No standard or formal dialect. As a learner of Arabic, we're confident that you'll enjoy and benefit from our easy story collection. Based on the cumulative experience of three leading teachers of Arabic as a foreign language, Kalaam Gamiil builds and develops communicative skills in Egyptian Colloquial Arabic, along parallel tracks of vocabulary and grammar. It is designed for students who have reached the lower intermediate level of Modern Standard Arabic and are now ready to branch out into their first experience of a major spoken dialect. Structured around basic topics that crop up in daily conversations, lessons each include a situation, a vocabulary list, preparatory sentences using the new vocabulary items, explanations of grammar in English, cultural information, and a variety of mechanical drills and communicative exercises. The book, volume one of a two-part series, focuses on the speaking and listening skills that will enable intermediate students to handle a variety of uncomplicated communicative tasks with native speakers of Egyptian Arabic successfully.